U.S. Ambassador to the UN Nikki Haley is having the week of her career, and inspiring many patriotic Americans while she’s at it. Haley has an undoubtedly difficult job. Her role as a liaison between the increasingly populist Trump administration and the evermore globalism-based United Nations puts the ambassador between a rock and a hard place. Filled with glass. And bees. Barefoot. In other words, it’s not a very glamorous gig, but Haley has been an absolute and unequivocal rockstar in recent days thanks to her mic-dropping moments on the floor of the General Assembly. It all began with President Trump’s decision to move the U.S. embassy in Israel from Tel Aviv to Jerusalem, making a de facto declaration of America’s recognition of the holy city as the Capital of Israel. This has predictably angered the non-Christian world, including the nearby Palestinians and their pals in the caliphate, who would much rather see Israel wiped off the map completely. In defense of this move, Nikki Haley has been on a warpath with the U.N., doling out punishing reminders to the General Assembly of America’s generosity and clout within the globalist organization. After the petulant posse of nations decided to continue bristling at the firebrand of an ambassador, Haley then dropped another bombshell: She’s cutting them off. 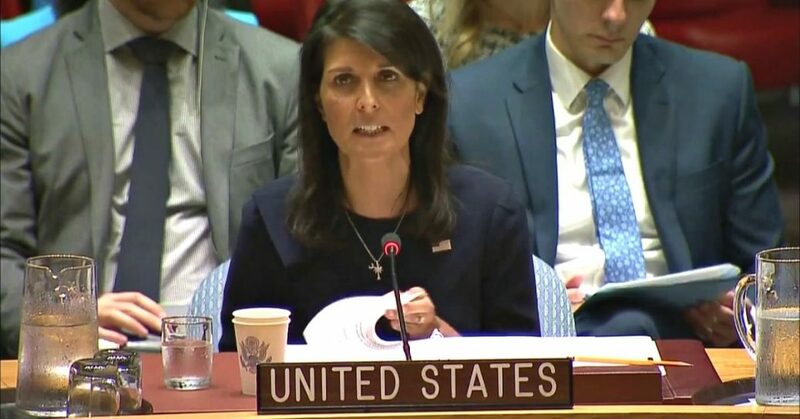 “Nikki Haley, United States Ambassador to the United Nations (U.N.), announced Sunday night that the federal government has reduced its contribution to the U.N.’s annual budget by 285 million dollars. Nikki Haley’s unenviable task has quickly become a stage for the rising star, whose stern and patriotic actions have infused a bit of action into the otherwise stuffy organization, and signaled to the world that the United States is back to doing with the United States does. To those who still wish to stand in the way of Nikki Haley, we wish them all the luck in the world. Entertainers Betray their Roles in LifeHow Can the Democrat Party and MSM be so Dishonest?